Hundreds of protesters took to the streets of Nantes and Toulouse in demonstrations against police violence.Both rallies were marred by violence,as protesters threw stones at security forces, who responded by deploying water cannons and tear gas. About 800 protesters gathered for a demo in the western city of Nantes on Saturday, local media reported, citing police. The people marched along the streets carrying a banner which read “Against police [brutality], social, economic violence... Resistance. " 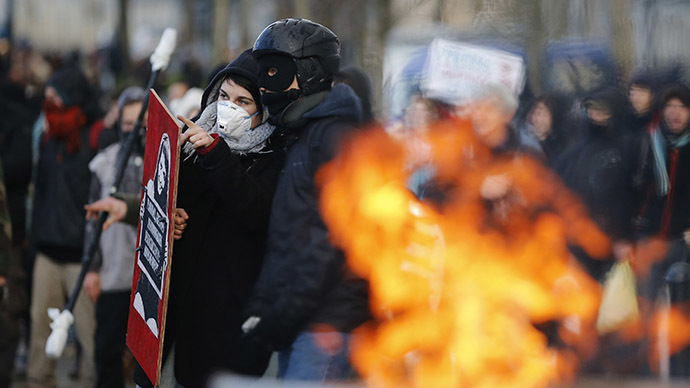 Tensions flared after masked protesters started throwing stones at police officers. Security forces used water cannons to disperse the crowds. A policeman was wounded and taken to a local hospital. At least 25 protesters were arrested – including one for carrying a weapon and another for throwing a projectile. The event was organized to mark the one-year anniversary of the 22 February protests, which attracted tens of thousands opposing the Notre-Dame-des-Landes airport project. Local residents said the airport would damage the environment and be too expensive for the region. The protests that followed brought together farmers, ecologists, and anarchists calling themselves ZADists – the French acronym for "development zone". In October, a ZAD member, Remi Fraisse, was taking part in a protest over a dam project in the Testet wetlands, near the southwestern town of Lisle-sur-Tarn. After a tense standoff between security forces and protesters, he was discovered dead with a wound to his back. The blame was put on a police grenade. Massive anti-police brutality protests gripped the country following the death; the first such mortality to hit mainland France since 1986. The anti-airport demos in 2014 turned violent, with police regularly deploying tear gas, water cannons and rubber bullets. Several protesters and policemen were injured. Both Nantes and the southern French city of Toulouse became the sites of frequent rallies. Toulouse, for its part, saw nearly 500 people – according to police figures – gather for a demo on Saturday. The protesters held a black banner with white letters commemorating the young environmentalist Remi Fraisse : "I am Remi and all the other victims of the police…We do not forget, we do not forgive." Some protesters carried flags for a far left group which has served to co-organize of the movement, and others shouted anti-police slogans. Protesters – mostly young and masked – reportedly used paintball guns and threw stones at local shops. Clashes also broke out at the Toulose courthouse. Local media has reported numerous arrests.